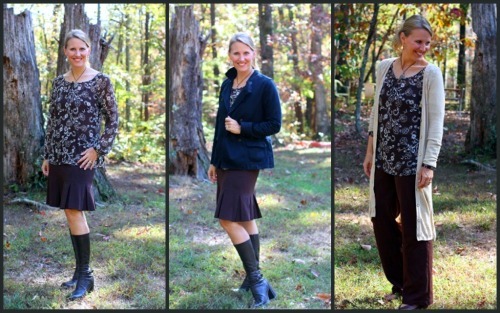 Are you familiar with my Frugal Fashionista Looks for Less series? If not, scan the archives and join me as I show you Designer Outfits for Pennies on the Dollar. Did I mention that 90% of the items are second hand? My first Frugal Fashionsta thrift store blog post took place March 27, 2009 entitled Designer Wardrobe on a Frugal Budget. Featured in that post was this Anne Taylor sheer shirt. Click on over to see the details of this designer outfit for $12, and how this Frugal Fashionista series began (then come back). As I was clearing out my closet last week, truly inspired to shop my closet and create multiple looks from one item, I ran across this shirt. I haven’t worn it in over a year, and typically, the organizing rule states if you haven’t worn it in a year, get rid of it. I realized I didn’t want to, but that also meant reinventing it, so I did. I knew I had posted this very same shirt already (gasp), but I thought I could encourage some of you on a strict clothing budget right now to reinvent looks yourself. When I came downstairs, my daughter declared that my $4 Goodwill Bandolino skirt looked like a Cheerleader skirt. Now, that is never a good statement, even if she meant it as a complement. I can understand her sentiment since I had it paired with these leather Bandolino pumps that I purchased at a yard sale for $2. (Yes, I had no idea that they were the same brand as the skirt until I just peeked to tell you). Even though quality runs deep through these shoes, they are more office attire or something traditional, so I threw them off for my fun, brown boots. Isn’t it amazing how just switching out footwear drastically changes the look of an outfit? Seeing them side by side shows how foot ware stands alone as a statement piece. In a few minutes, I was able to browse through my closet, vary this look by just using what I had, while still making it fabulous for both casual and dressy. The best part about all of these looks, is that each one came in UNDER my $15 Frugal Fashionista goal, including the shoes and boots. Great reminder for us to all go back to our closets! I really like the look of the pumps with the skirt – just thought I’d weigh in. 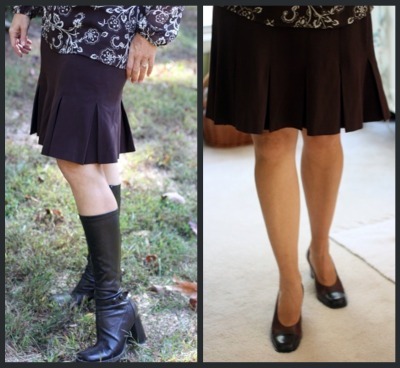 Two Frugal Fashion posts in a week…oh, I was hoping that this would happen 🙂 I have one pair of boots, like yours, and I always feel great in them! You look fabulous, love the long sweater with the comfy pants, just ‘my style’ on a regular day! Thanks for sharing! Happy Day! @connie, Haha….yep, I had to get back to my Friday posting. 🙂 Monday through me for a loop, but now it’s Thanksgiving weekend, so I doubt you’ll see one next week. Wow- this looks great!!! I am terible with clothes. I have NO fashion sense at all!! You are an inspiration! I just spent the morning at the thrift store and have some great new outfits for my self, 3 pairs of shoes for my little girl, and warm winter gloves for my boys all for around $50. In the past I would of spent about that much on just one outfit for myself. Thank You! Great advice, as always! Thanks for the gentle reminder to shop the closet. You look fabulous in ALL the photos. I honestly like it with the pants. Love that look. I too have several things I go back to every time I discover them in my closet. This week though, I pulled out the tote of winter clothing, as well as the tote of maternity clothing :), and am feeling a bit overwhelmed about how to fit everything in the closet (and what really fits)! I know this is totally off subject, but what is the color on your walls? The pretty greenish color. Do you know the name and brand? If so, please share. Love you blog!!! I just want to thank you a million times over for these posts. I love love love clothes. I love love love to shop. Once we had children I felt really deprived because I felt like I couldn’t get new things for myself. I was wearing clothes way past their prime. Since I started reading your blog about a year ago I’ve gotten past my fear of the thrift store and find awesome deals all the time, not only for me, but for my children as well. In fact today I just scored two great sweaters and a black wool winter coat, plus a small stuffed animal to pacify the three year old I had in tow, at Goodwill for under $10. I’ve been able to replace most of my winter wardrobe (I’m telling you it was bad) for about $50 dollars this year. Thanks for your encouragement. Great outfit. It looks like you could use the brown boxy tote from Vera Bradley that I got at Goodwill for $5. The price tag was still on it for $84. That is my frugal deal of the year. It is actually a little larger than what I carry so, I have listed it on Craig’s list for $38. If it doesn’t sell then I have a great handbag, but we need the money for Christmas so we’ll see what happens. All the outfits are great. The boots change everything. Love this part of your blog.